Home \\ Blog \\ Canning or Bottling: Which Is Better for Your Brewery’s Bottom Line? Running a successful brewery means finding ways to improve processes while creating a product consumers will love. The importance of beer quality cannot be underestimated, while the cost of production needs to stay within budget. Customers want a product they can rely on, so consistency is key in your fluid and material-handling processes. One of the most critical decisions is whether to can or bottle your beer, and there are many elements to factor in when it comes to the packaging that’s right for your brewery’s bottom line. The first thing to consider is which packaging method will save your brewery the most money. In initial production, aluminum cans and bottles are competitive. Each has an edge in certain situations, depending on the size of your brewery. The cost of cans vs. bottles has fluctuated greatly over the past decade or so. Bottles have been the traditional container for beer for centuries. The most popular theory on the origin of bottling states that about 500 years ago, an English rector decided to store some beer in a bottle to consume later and ended up accidentally leaving it on a beach. When he retrieved it several days later, the beer had undergone a secondary fermentation and had the carbonated kick we know and love today. Glass was common even then, and prices have only gone down over time. Aluminum, however, is a more recent development and therefore costs more on average. In 1935, most cans were made from steel or tin. It wasn’t until 1959 that Coors started rolling out all-aluminum cans in a 7-oz. size. This marked the beginning of cans as a popular vessel for beer. As technology has advanced, the cost of aluminum cans has come much closer to that of glass bottles. Today, an aluminum can has an average wall thickness of 0.097 millimeters, making it approximately the width of a human hair. The technology that makes this possible also drives down cost to be much more competitive with glass on a container-by-container basis. One drawback to cans is that minimum orders are higher than many small brewers can afford when starting out. Most manufacturers require breweries to order at least one tractor trailer load of cans, which contains 26 pallets. This can work if your brewery only has one or two brews, but the costs become impractical if you want to produce multiple lines of beer. Your brewery’s brand imaging factors into the cost of bottles and cans as well. If you choose cans for multiple types of beer, you can avoid the costs of the minimum order by ordering one batch of blank cans. You can then split up the batch and send them off to a third-party company for shrink sleeve labeling. You could also purchase a sleeve labeling system if your brewery wants to label beers in-house. Either of these options increases the cost per can in the long run, but the extra expense might be worth it if you are looking to get started with the minimum number of cans. Glass bottles always come plain, which factors into their lower cost. Bottle labeling machines are also significantly less expensive than shrink sleeve labelers. Some breweries looking for the lowest costs opt for can labelers, which are becoming more common and more affordable. The 2018 introduction of a 10 percent tariff on aluminum imports has thrown the price of aluminum into more flux than it has experienced in the past. 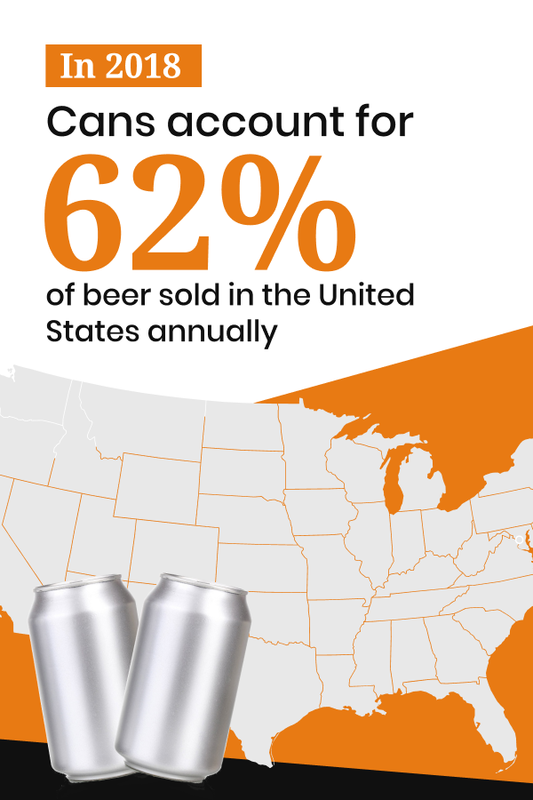 Because cans account for 62 percent of beer sold in the United States annually, the tariff led to an immediate increase in costs before it was even enacted. The Midwest Premium is a fee that buyers of aluminum pay for delivery in the United States — regardless of the aluminum’s origin. Mere hours after the tariff was announced, the Premium jumped from 13.4 to 16 cents per pound of aluminum, a 19 percent increase. Later in 2018, it rose to 17.5 cents per pound, marking an increase of 31 percent. The full impact of the tariff on the beer industry won’t be known for several years, but large brewers are already feeling the effects. MillerCoors estimates the tariff has cost them $40 million so far, a staggering sum even for such a huge company. For smaller brewers, the increased cost of aluminum cans means their edge over bottles is slightly diminished. However, cans are currently still less expensive to obtain than bottles. The cost of equipment is a big consideration for breweries. Because the technology of bottling lines has been refined over hundreds of years, there are plenty available to choose from. With bottles having dominated the market for so long, manufacturers have stiffer competition and brewers have benefited from lower prices. While canned beer has been around for decades, the influx of small craft breweries switching to cans was sudden enough to spike prices. A canning line costs significantly more than a bottling line but requires fewer human operators. Bottling takes more time and labor overall, but the upfront cost of equipment is much lower. For small breweries that need to get started with limited funds, a hand-filling bottling line is the most affordable option. Many small breweries start off with a small hand-operated bottling line because of the lower initial cost, and then invest in a canning line as profits allow. It’s also possible to begin with a small bottling or canning operation and upgrade it over time. Some systems are easier to upgrade than others, and customized solutions may be needed to modify them. It’s much faster to fill a can than a bottle, due to their disparate shapes. Long neck bottles have an opening under an inch, so filling must be more precise and proceed slower to avoid overflow and excess carbonation. With their wider top opening, cans can take a much larger stream of liquid in a shorter period. The faster filling speed translates to savings over time. Because bottling lines are generally simpler than canning lines and rely more on human input, their maintenance costs are lower in the long run. Canning lines come with more automation, more parts and more systems than the average bottling line, so having a reliable company to provide support for your canning line is essential. The simplest bottling lines have few moving parts, which means fewer opportunities for something to go wrong. But as lines move up the ladder in terms of complexity and automation, they require more proactive maintenance as well. Your brewery’s costs continue even after each brew is safely bottled or canned. The problem of portability and distribution looks very different when you are transporting cans versus bottles. Aluminum cans take up much less space than glass bottles due to their thinner walls and more uniform shapes. Canned six-packs, in particular, are easier to store because most bottled six-packs can’t be stacked on top of each other without the introduction of stabilizing and cushioning materials. Canned six-packs can be stacked with little to no risk or extra equipment. This also translates to a savings in cardboard and other extra materials. For more established breweries able to design and build their own production facility, space isn’t usually a concern. For start-ups and mid-size breweries, working with the space you have is more of a challenge. Cans are no doubt the most space-efficient choice for a brewery with storage concerns. Cans are significantly lighter than glass bottles. The average bottle weighs about 8 oz. while an aluminum can weighs under half an ounce. This substantial difference in weight impacts transport on the front and back ends of production. When you’re sending out hundreds or thousands of bottles, the fuel costs of transporting a heavier product quickly compound. Because cans are about half as tall as bottles and don’t require extra packaging to keep them from knocking together, breweries can fit two to three times as many cans into a trailer. Bottles carry more inherent risk during transport because they’re breakable. From employees carrying cases to the truck to the unload at each delivery point and all that jostling from interstate delivery in between, there are many points where a glass bottle might break. When someone drops a case of cans, they can likely pick them up and move on. Broken bottles mean time taken out of busy schedules to ensure proper cleanup. When it comes to moving beer around, cans are the clear winner for breweries. Beer Quality: Cans or Bottles? Brewers are constantly looking for the most cost-effective ways to brew, but always in service of the ultimate goal — high-quality beer. In the early days of the industry, canned beer was a sure sign of low quality and perceived as a shortcut taken by cheapskates. The expanding popularity of canned craft beer shows that consumers are willing to rethink this assumption, but the debate over beer quality is still alive and well. Your customers want a beer that tastes good, and many consumers swear that bottled beer tastes better than canned. A study published in the journal Beverages examined people’s perceptions and preferences of canned and bottled beer with a two-stage survey. In the first experiment, participants received beer from either a bottle or a can. Researchers showed the participants the bottle or can and allowed them to pick it up before they tasted it. Researchers poured the beer into cups for serving, to ensure the headspace did not affect flavor. In this experiment, more than 61 percent of respondents preferred the bottled beer and 27 percent said they tasted about the same. Only 11 percent preferred the canned beer. 45 percent rated the canned beer better than the bottled. 41 percent rated the bottled beer better than the canned. About 1.5 percent said the flavor was the same. The takeaway is that there is no qualitative flavor difference between canned and bottled beer. Consumers are heavily swayed by preconceived notions about quality that don’t bear out when tested. Flavor isn’t a quality factor that differs between the two packaging methods. When it comes to keeping beer fresh, cans have a slight advantage. The most damaging elements to a beer are light and oxygen. If a beer is exposed to too much oxygen trapped inside the container, it develops an unpleasant musty flavor that customers will notice right away. Aluminum cans are sealed with as little headspace as possible to minimize the possibility of degradation due to oxygen. To achieve this, canning lines inject a shot of carbon dioxide (CO2) into the can just before the lid is sealed. The technique used to seal cans prevents any air whatsoever from permeating the seam. Automated bottling lines often pass the bottles underneath a highly pressurized water jet to foam up the beer, which drives out the oxygen and replaces it with CO2. The system then applies the cap before air has a chance to re-enter the bottle. Many small to mid-sized breweries fill bottles manually with the use of a counter pressure filling head that directs carbonated beer into a pressurized bottle and results in minimal loss of CO2. In regards to light contamination, cans are completely impervious. Aluminum cans block all light. Light contamination in bottles is only an issue for clear and green glass. Amber bottles successfully block the majority of light below the threshold of 500 nanometers, making them as good as cans at blocking the most harmful types of light. The main advantage of cans is that preventing oxidation is usually a built-in feature of the filling line, whereas bottles require more equipment to ensure oxygenation does not damage the final product. Bottles are also more likely to be improperly sealed, leaving air to leach into the bottle over time. Cans are steadily becoming more popular as more brewers become convinced that canning is the best method for packaging beer. In 2008, 56 percent of the beer brewed and sold in America came packaged in cans. By 2018, that number jumped to 62 percent. A good proportion of cans come from large-scale breweries that sell in quantities up to the case, but craft brewers are making up more and more of the canned beer segment. One of the biggest obstacles to canning for craft brewers is consumer perception. The average craft beer connoisseur is pickier than most, and it’s difficult for brewers to convince longtime customers that their perceptions about canned beer quality are wrong. Despite evidence that flavor is the same between the two packaging methods, 71 percent of consumers insist that bottling in glass results in a better tasting beer. Is Canning the Best Method for Breweries? Reduced transport costs due to lighter weight product. Improved storage capacity due to smaller form factor. Reduced risk of loss due to breakage. Faster filling for greater long-term efficiency. No danger of light contamination and minimal risk of oxygen contamination. For breweries that can afford the higher upfront cost of a canning line and large minimum orders for cans, the long-term savings make canning a smart option. The production costs of cans vs. bottles favor cans over time. Many breweries factor environmental impact into their choice of packaging material. In this arena, aluminum cans are the decided winner. Cans are usually made of 70 percent recycled material, whereas bottles only contain between 20 and 30 percent. Consumers also recycle cans an average of 20 percent more often than they do glass bottles. Is Bottling the Best Method for Breweries? At first glance, the advantages of aluminum cans make them seem like the obvious choice. But for many breweries, bottling still makes the most sense. Glass bottles still comprise about a third of beer sold in the U.S. and two-thirds of premium beer comes in bottles. Lower order minimums for bottles. Lower cost of bottling line equipment and maintenance. Better traction with consumers of high-end beer. Consumers, especially of craft beer, believe that bottles offer a quality advantage over cans. With its lower upfront cost, bottling is a smart choice for small craft brewers working to break into the industry. Whether you go with bottling or canning, getting the right equipment is the best way to ensure the lowest expenses for your brewery. If your bottling or canning line is less than top quality, you’ll find yourself spending more on it over the course of its life. When one piece in a bottling or canning line doesn’t function correctly, you’ll experience a drop in consistency from batch to batch. This inconsistency might be as small as a slight change in flavor between one batch and the next, but that can still be enough to lose customers if the batch goes out to stores, bars or restaurants. In the worst of cases, you may experience contamination and have to recall your product. Rather than paying more for maintenance and repairs down the line, it makes sense to set your brewery up with quality equipment from the start. SEMCOR offers a full array of equipment breweries need for safe and efficient bottling or canning. Our solutions are designed with a focus on low cost of ownership and exceptional service. Breweries are constantly handling irregular fluids containing yeast or mash. In addition to containing some solids, these materials can be abrasive to your equipment. SEMCOR’s variety of fluid handling solutions are highly adaptable to the needs of your brewery. All fluid handling solutions are designed to function in environments with high temperatures and fluctuating pH levels. Every fabrication and modification is made from high-quality materials chosen for durability, including PTFE, plastic, rubber and metal. Conveyor belts are an integral component of any production line. Every can or bottle will touch the surface of the belt, and safety is paramount in food and beverage processing. With so much cleaning and sterilizing required to maintain a sanitary facility, brewery belts need to be tougher and resistant to microbes. The line of belts we recommend to breweries includes the premium HabaGUARD belt with anti-microbial properties. At SEMCOR, we understand that your brewery needs reliable equipment to produce a consistent beverage for your customers. We also understand that not every brewery is the same, and that one solution will not fit the needs of every business. We work hard to provide an array of solutions that will fit your brewery, and we’re proud to offer customized solutions that match your specifications. If you have questions about customizations or how SEMCOR can improve your canning or bottling process, please don’t hesitate to contact us for more information.